We carry some of the most technologically advanced lens designs, materials and high performance coatings. Plus our warranties are there to back it all up! We were one of the first and we're still one-of-the few offices to utilize the new digital freeform lens technology. These lenses have the fewest distortions and are the most accurate available today. The lens designer takes into account the prescription, the fitting height, the distance between the pupils and the tilt & wrap of the frame. The lens is then custom cut to your exact measurements. Freeform lens designs are the most popular in progressive addition lenses, but are also available in single vision and bifocal designs. We’re excited about the new Recharge EX3 Non-Glare coating. This product is especially formulated to help block up to 30% of the high energy blue light that is emitted from LED devices. If you’re on a computer, use a tablet or smart phone, then this is the coating for you. Recharge can help to decrease eye fatigue and strain. There is also evidence that blue light can suppress the body’s production of melatonin, which can disrupt sleep patterns. Blocking that high energy blue light can actually help you sleep better! Recharge reflection free lenses reduce eyestrain and fatigue caused by blue light waves. Phoenix lenses are known for their light weight, impact resistance and their ability to block 100% of the sun’s harmful UV rays (even though they are clear). But did you know that they produce sharper peripheral vision with less chromatic aberrations. 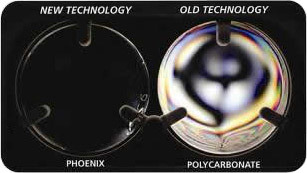 Phoenix lenses also have less internal stress and produce sharper central vision than polycarbonate lenses. The Big Box stores sell a lot of polycarbonate because they can sell it for a cheap price. We’re so convinced that Phoenix lenses are superior, we actually price them the same as polycarbonate to make them affordable on any budget. This demonstration shows the chromatic aberration distortion inherent in polycarbonate lenses. The Phoenix lens on the left is virtually distortion free. Visit the HOYA lens selector by clicking the link below to learn more about all of the new lens designs and coatings.